Barry Norris, the LBNE cryostat and cryogenic systems manager, thus summed up the just-completed first phase of testing for the 35-ton LBNE prototype cryostat. As reported in May 2013, the 35-ton cryostat was constructed to demonstrate that a non-evacuable “membrane” cryostat, the type chosen for the LBNE far detector, can satisfy the less-than-200-parts-per-trillion (ppt) requirement on oxygen contamination of the liquid argon in the detector and maintain that level stably. On Dec. 20, during a marathon 36-hour session, PPD engineers David Montanari and Terry Tope cooled down the membrane cryostat — slowly and smoothly — to 110 Kelvin (-262 F), at which point they commenced the transfer of about 5,000 gallons liquid argon, maintained at about 89 K (-299 F), from the Liquid-Argon Purity Demonstrator to the 35-ton cryostat. 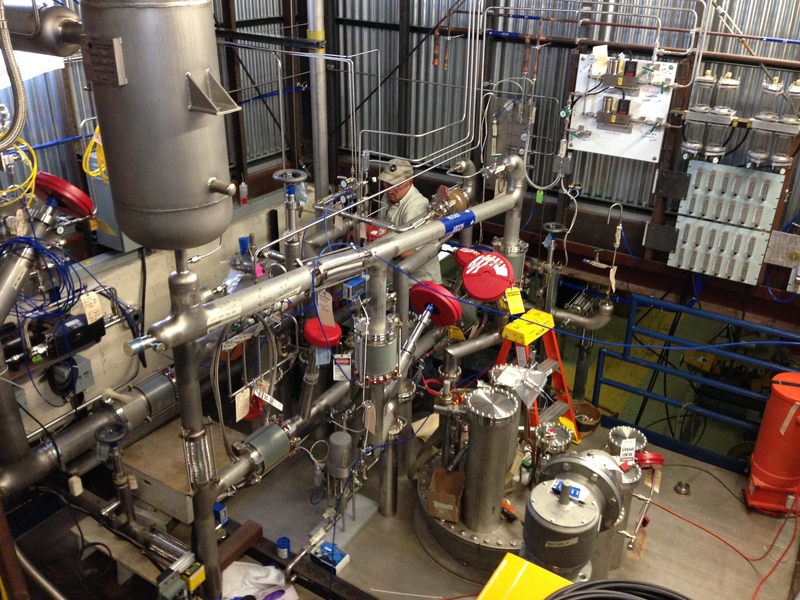 (View a video of liquid argon in the cryostat.) By the end of this session, the team was able to verify that the systems for purifying, recirculating and recondensing the argon were working properly and to begin the purity testing. “It is an excellent Christmas present,” said LBNE Co-spokesperson Milind Diwan of Brookhaven National Laboratory in congratulating the team. He recognized the accomplishment that the cryostat, the systems that function in and around it, and the connections to and from these systems satisfy the very stringent requirements on placed on them in regards to purity, leakage and electronic noise placed on them. PPD scientist Alan Hahn ran the argon purity tests, in which he measured the lifetime of ionization electrons traveling through the argon, accelerated by an electric field. Purer argon has fewer contaminants present to intercept the electrons, therefore they can travel for longer times, on average. Hahn measured electron lifetimes to be between 2.5 and 3 milliseconds, nearly twice the goal of 1.5 milliseconds, corresponding to an oxygen contamination of only 100-120 ppt. Following the success of this test, the cryogenics team, Tope and PPD Engineer Mark Adamowski will continue to tweak the knobs and levers for another two weeks, studying and improving the system in preparation for a second phase of testing. The Phase II testing program, scheduled to take place at the end of 2014, will focus on the performance of active detector elements placed directly in the volume of liquid argon.